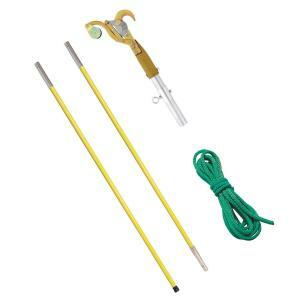 This professional 12 ft. pole pruner set makes your pruning jobs easier. Contains Two 6 ft. Yellow SherrillTree Fiberglass Poles - one with a rubber boot at one end and female end on other and the other with both male and female ends. One SherrillTree Pruner Head, and 16 ft. of pruner cord. This versatile pruner can cut limbs up to 1.25 in. in diameter and can also be fitted with an optional SherrillTree saw head and blade (not included - use 28718 SherrillTree saw head and 35166 or 35167 SherrillTree saw blade). ELECTROCUTION HAZARD. Always stay 50 ft. from electrical hazards or energized lines (power lines). Tbook.com crawls the web to find the best prices and availability on Tree Pruners and related Tools and Hardware products like Notch Pruner with 2 ft. - 6 ft. Yellow Fiberglass Poles. For this page, related items include products we find that match the following keywords: "Tree Pruner" at our vendor partner Home Depot. Notch Pruner with 2 ft. - 6 ft. Yellow Fiberglass Poles is one of 75 Tree Pruners and related products listed in the Tools and Hardware section of Tbook.com If you have any questions on this product, please give us a call at 734-971-1210 during the hours of 9am - 5pm EST for assistance. Thank you for shopping at Tbook.com, the Internet Department Store!